EB Cycling Law is proud of their partnership and support of Rider Safety Visibility. Rider Safety Visibility, also known as RSV, was launched to build awareness and improve greater standards in cycling safety due to an increasing number of distracted drivers, and fatalities. 47% of accidents happen during daytime hours. Efforts to influence cyclist’s behavior (day and night) and stack the deck to be seen has been tested through merging networks of brand manufacturers, engaging all cyclist in a call to action, co-campaigning for alternative transportation and climate action as well as challenging political and community leaders alike to lead safe and healthy lifestyle options. EB Cycling Law and other partners of RSV have contributed to program growth and recognition on a national level, as the leading source for activating all ages and all skilled cyclists to increase sensitivities while cycling on and off-road. Use front and back blinking lights on your bicycle at all times, even during daylight hours so you are more visible to drivers sharing the roadway. Research indicates visibility is the single biggest factor in avoiding being struck by a car or truck. You can buy a Bluetooth-activated helmet with lights that also indicates the direction you plan to turn or change lanes. LED lights around the wheels and the bike frame are recommended for night rides. With the wheels lit up you can be seen from every angle. Cost is approximately $10-$12 per wheel installed. Always wear light-reflective clothing and shoes when riding at night and bright colored clothing during the day. Consider wearing a bright, reflective vest whenever you ride, no matter what time of day it is. Ride in the center of the lane if motorists cannot safely pass while staying at least 3-feet away from you. Use a bell to alert others of your presence. Use bike paths and lanes where available. Ride in the direction of traffic and adhere to lane positioning, riding three feet to the right of traffic when sharing lanes, or riding in the middle, if the lane is not wide enough to share. Motorists must stay 3-feet away from cyclists traveling in the same direction and may not pass them if they cannot safely do so (Three Feet for Safety Act – CVC section 21760). Scan the roadway up ahead for debris, street defects, and uneven pavement/potholes. Look over your shoulder before turning and use hand signals to indicate your moves to others. Be alert for pedestrians, children, and dogs. Ride a bike that fits you, is easy to control, and has working brakes. Obey signals, signs, and road markings. Always be alert, don’t ride while distracted, such as while texting. Yield to crossing traffic when you don’t have the right of way. Never hold or hitch onto vehicles. Follow speed positioning, with slowest vehicles and bicycles staying farthest to the right, and only passing on the left. Follow intersection positioning, using the right-most lane when a lane is used for more than one direction. Take a bike class to learn proper riding skills. Children under the age of 10 should ride their bike on the sidewalk instead of on the roadways if it is legal in your neighborhood. It is never recommended for children to ride a bike after dark because they are even more difficult for others to see. RSV offers sponsorship, e-commerce, and grant opportunities to participating companies and organizations designed to help spread the word about their products and to inform cyclists about the latest RSV technology. The products are vetted to ensure they enhance rider visibility and safety, are high quality and functional. Participating companies must be active in two of the three relevant areas of focus: rider, safety or visibility. EB Cycling Law and RSV are dedicated to keeping cyclists safe! 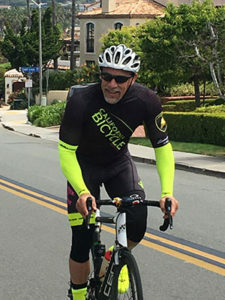 In the event you or a loved one has been injured in a cycling accident, call us for a free, confidential consultation (800) 925-0723 or (619) 295-0035.